An artist's depiction shows the planet-mass object (SWIFT J1756.9-2508)in the foreground with a pulsar (upper right), which is tidally distorting the companion into a teardrop-shaped object, and ripping gas from it. The smaller companion orbits its parasitic companion from a distance of only about 230,000 miles--slightly less than the distance between the Earth and moon. It has an estimated minimum mass of only 7 times that of Jupiter, but it could be much larger. Unlike three Earth-sized objects found around a pulsar in 1992, scientists do not consider the new object to be a planet because of how it formed. "It's essentially a white dwarf that has been whittled down to a planetary mass," said study team member Christopher Deloye of Northwestern University. Scientists think that several billion years ago, the system consisted of a very massive star and a smaller star about 1 to 3 times the mass of our sun. The bigger star evolved quickly and exploded as a supernova, leaving behind a spinning stellar corpse known as a neutron star. Meanwhile, the smaller star began to evolve as well, eventually puffing up into a red giant whose outer envelope encapsulated the neutron star. 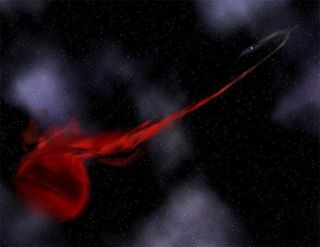 This caused the two stars to draw closer together, while simultaneously ejecting the red giant's envelope into space. After billions of years, little remains of the companion star, and it's uncertain whether it will survive. "It's been taking a beating, but that's part of nature," said study team member Hans Krimm, also of NASA Goddard. Today, the two objects are so close to each other that the neutron star's powerful gravity siphons gas from its companion to form a spinning disk around itself. The disk occasionally dumps large quantities of gas onto the neutron star, creating an outburst like the one detected in June. The system will be detailed in two studies authored by Krimm's team and a team led by Deepto Chakrabarty of MIT, which reached the same conclusions, to be published in an upcoming issue of Astrophysical Journal Letters. The system is only the eighth pulsar with a period of about one millisecond that is known to be accreting mass from its companion. Only one other such system has a pulsar companion with such a low mass. The companion in that system, XTE J1807-294, also has a minimum mass of about 7 Jupiters. "Given that we don't know the exact mass of either companion, ours could be the smallest," Krimm said.